Statistics show that small business owners benefit most from joining a PEO. As your business grows, naturally you have to hire more staff. Suddenly, the time you spend managing HR tasks and payroll increases as well. Often, small business owners find themselves stuck in a rut, managing all of the administrative and HR tasks and not being able to focus on business strategy, which can stall growth. Many small business owners find the solution for this common problem in using a Professional Employer Organization (PEO) to manage their payroll, benefits, new-hire paperwork and other HR tasks. Approximately 14 to 16 percent of small businesses with 10-99 employees partner with a PEO for their HR and benefits needs. A 2017 survey of business owners done by the National Association of Professional Employer Organizations (NAPEO) found that the majority of business owners were happy with the results of using a PEO with 98 percent saying they would recommend a PEO to a small business colleague. Benefits are just better: A PEO can offer better benefits at lower costs by pooling their clients’ employees together. This can even include additional benefits, such as dental, vision, and life insurance, that are often too expensive for a small business to offer. Not only does this help employers and employees save money on their insurance benefits, it helps small business compete against larger companies when trying to recruit skilled workers. Consistent compliance: Employment law is constantly changing, and it’s not easy for employers to keep up with the latest updates or changes. 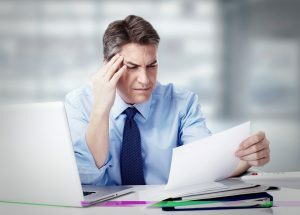 Something as simple as a paperwork error can cost a small business owner thousands of dollars or more in legal fees and penalties. Because PEOs focus on HR administration, they are constantly up-to-date with the latest changes to employment law, ensuring their clients stay compliant. Happy employees: Competitive benefits, consistent compliance, a well-organized payroll system, knowledgeable HR staff, and more time freed up for employers to focus on the business; all of these aspects work together to help ensure employees are engaged and able to focus on their jobs. The average overall employee turnover rate in the United States is approximately 42 percent per year, based on 2012 data, but according to a NAPEO survey, it drops down to between 28 and 32 percent for businesses that used a PEO for at least four quarters. 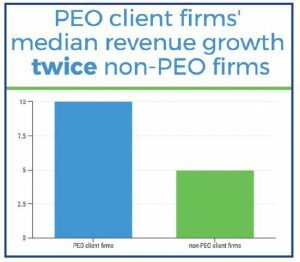 Significant growth: PEO clients surveyed by NAPEO in 2017 reported a 10 percent median revenue growth from 2015 to 2016 versus 5 percent for similar non-PEO firms. 70 percent of employers surveyed by NAPEO reported that their revenues have increased and 66 percent reported that their profitability has increased since becoming a PEO client. Employment at small businesses using PEOs has shown significant growth as well; Since December 2004, employment for small-business PEO clients has grown more than 7 percent faster than at small businesses overall, according to the Intuit Small Business Employment Index. If you're spending too much time on HR tasks and not enough time on growing your business, it may be time to look into HR Outsourcing through a PEO.